Years ago I used to love “guitar adventures,” where I’d plan out a route and travel to all the old pawnshops and guitar stores I could manage in a day’s drive. These drives happened in the times before my wife and kids, when the most pressing responsibilities were saving change for gas and having a good mix tape in the car. Yeah, those were the days! So anyway it was on one of these long winding drives that I crept into a music store parking lot with a bit of apprehension, because the music store didn’t seem like much of a store at all. It was one of those thin, row homes that look like slices of cake stacked neatly down narrow streets and pre-war row homes. And this was one of those old haunts that hadn’t changed much since the 1960s. These establishments are really rare today, but 25 years ago some of these stores were still hanging on for one reason or another. I only knew about this particular music store from a friend of a friend (the days before the internet) who mentioned there “might” be a music store still around. The owners lived upstairs and the music store was on the first floor, and the hours for opening and closing depended on the ring of the doorbell. And so it was that my grizzled mug appeared at the door one sweet spring day. The owners of the shop were plump and kind, a bit indifferent to the business perhaps, but still sweet in a grandparent sort of way. They opened up the store with a few turns of the key and I swear to you, dear reader, that when the lights flickered on I was stunned. This store contained artifacts of all sorts from days past. Old boxes of DeArmond pickups were piled like cord wood on the shelves behind the heavy wooden counter. National (Valco-made) guitar amplifiers dating from the 1960s were stacked like a cubist puzzle along the long, narrows walls. And the guitars… good grief! So many guitars representing every era from the 50s to the 80s were hanging on the walls, dusty and dull in the light, but still giving my eyes fits like the first time you walk into a casino. It was really sensory overload. As the owners (Harry and Marty I remember) settled down behind the counter and flicked on an ancient TV, I browsed the merchandise with careful inspection. I mean, the prices on this stuff reflected the era. In one spot I’d spy a late 60s National guitar with the original tag of $150 (ON SALE!!!) and then at another wall a mid 80s superstrat with a tag of $400. This all just didn’t jive in my mind, this confluence of eras and instruments in one place. I had a hard time wrapping my mind around it all. I really could’ve spent my life savings at the store, but Harry and Marty were way past the point of making sales. If something sold… ok. If it didn’t sell…oh well. They were content watching game shows on the TV and mildly planning for the day when they would sell off the building and everything in the music store. And so it went for the next few hours as I engaged these kind folks about the music business and import guitars and the guitar boom that shook the music industry in the 1960s. Harry and Marty really schooled me that day, and basically planted the seed for a book I always wanted to write. But let’s go back a bit in time. After World War II, people were enjoying life again. Those were the salad days! The dawn of rock ‘n roll convinced people that the guitar was a primary instrument rather than part of a big band. But kids were still more likely to take piano or accordion lessons than guitar lessons in the 50s. That began to change in the late 50s to some degree, but it wasn’t until the Beatles hit in the early 60s that the boom years began. Starting around 1963, there was a demand for electric guitars in America that was unlike anything seen before or since. Of course the well established companies like Fender and Gibson were catering to the better musicians, and even beginning guitarists could find good used bargains on these finer guitars. But for the entry-level buyer and beginning player, companies like Harmony, Kay, and Danelectro (these companies did make excellent guitars but also catered to a lower price point) were soon cranking up production and yet still having a hard time keeping up with demand. So a few enterprising individuals gazed across the pacific to Japan. There were already some import companies of the time and they had discovered the cheap labor costs and high quality of some Japanese products. There were even some inexpensive guitars reaching American shores in the late 1950s. Additionally, there was an American presence in Japan mainly in the form of military bases and many military families. The earliest guitar makers in Japan catered to these soldiers, selling lap steel, hollow body, and electric guitars to the American folks. In the early 60s there were a few established electric guitar makers in Japan, primarily Teisco, Tokyo Sound (Guyatone) and Fujigen. But in a few years those three guitar makers would be joined by about 25 additional makers from all over Japan! Many of these newer guitar makers transitioned from making wooden caskets, barrels, and sandals to making electric guitars! Between 1964 and 1967, the demand for electric guitars was so great that many factories simply repurposed their efforts. These factories were mostly wood processing facilities, and almost all of them had excellently cured wood that made for a safe trip across the ocean to the very different North American climate. From published accounts, the early Japanese guitar makers were very concerned with quality and originality in design. Teisco and Tokyo Sound were producing everything from pickups, electronics, and even guitar strings (often hand wound from imported German piano wire). But as demand increased and import companies started to battle it out for sales with corporate competition (remember these were the days of CBS buying Fender) and mail order catalogs like Sears and Montgomery Ward. Importers, jobbers, and music stores were all looking for the flashiest and most inexpensive guitars a working family could buy. And so it was that quality often went out the window, in favor of aesthetics and price point. The notion of poorly built Japanese guitars was soon established here in the states but the extreme guitar designs still won favor among American youth who just wanted to sling a guitar around the garage and make a racket! It was this era of Japanese guitar production that I became fascinated with, and kept searching out. While I was growing up in the 80s and 90s I kept discovering strange examples of Japanese guitar creativity. As Americans, most guitar players are familiar with the common lines of the Fender Stratocaster, the simplicity of the Telecaster, the beauty of the Gibson Les Paul. These images are basically etched onto our brains through simple repetition. After some time I became numb to these guitars and the commonality of the design. They were all great designs, but when I started to see guitars with four pickups, sparkle finishes, and a multitude of switches and knobs, then my curiosity was piqued. It was a very cool time to grow up because most of the extreme guitar designs were still left over from the 1960s in pawnshops and old music stores… usually relegated to the bargain bin and back rooms and sold for 1960s prices. For the price of a fluorescent superstrat I could buy six vintage Japanese electric guitars! And being the son of a welder and a beautician, my options were often limited to these cheap buys. Soon my basement began to resemble a guitar repair shop, where I would assemble parts and build my own wacky guitar creations. But there was one guitar I didn’t alter, and that was my first electric guitar. It was a Marvel EJ2 and I loved that darn guitar. My parents bought it for me when I was 10, and it was my favorite. It didn’t play that well, and the pickups always had a distorted quality but I loved it. It was this EJ2 that always had me wondering about the Japanesemakers. Who made the guitar? Who designed it? The history of most American guitar makers was well known, but there wasn’t much information to be found with the Japanese makers. Most of the electric guitars of the 60s carried the brand names of the importer, the distributor, or the seller and often there was no way to determine the origins of a guitar. At least a Teisco was made at the Teisco factory, and the Guyatone guitars were made by Tokyo Sound. So I started to go through my pile of guitars and examine the little things, like the dimensions of string retainers, and names on the back of the volume and tone pots, the build construction, and about 10 other attributes I measured and cataloged in an ongoing database that became filled over the course of 10 years. Soon I had organized my random pile of guitars into 17 categories that corresponded to factories. Now at this point I must confess that looking back at this data collection, I can’t quite point to my motivation, but for whatever reason I dove into this project with a serious drive to learn more. From there I started emailing Japanese factories and I met some Japanese friends through roughly translated emails and online bulletin boards. My contacts abroad continued to grow and soon I had befriended guitar company founders, executives, designers, and retired employees. To be honest, conversing with people across the globe became the most exhilarating part of this experience. 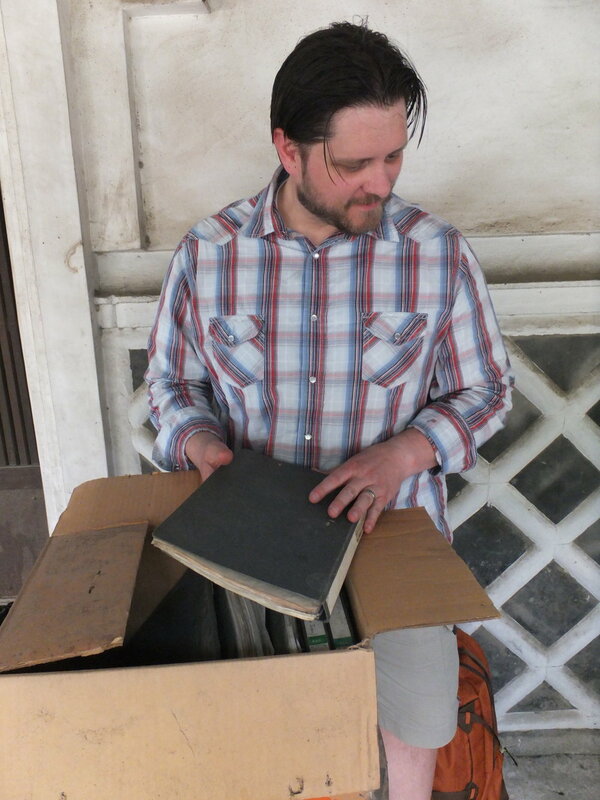 Finally in 2013 I made my first trip to Japan and spent two weeks interviewing people and visiting locations with guitar history. Soon after I returned to the states, I started writing the book. While writing I kept thinking back to my guitar adventures and the day at Harry and Marty’s store. I must’ve spent six hours there, talking and gawking and buying! I remember I brought five guitars home with me from that old store, and two years later the place was gone. Erased from history if you will. I kept thinking that if I didn’t document this era of guitar history then it would be gone forever, like all the guitar and music shops that have vanished over the past 30 years. Frank Meyers’ meeting in 2013 with some of the current and retired Fujigen employees. He presented his EJ2 back to them and their museum. In return, they presented him with the first prototype of the EJ style body. Fujigen’s first electric guitars were the EJ series. When I returned to Japan in 2015, three of the nice men I interviewed had passed, yet I remained truly thankful for their time and their infor-mation. I have to laugh some-times when I think about the reserved surprise of the Japanese people I spoke with. 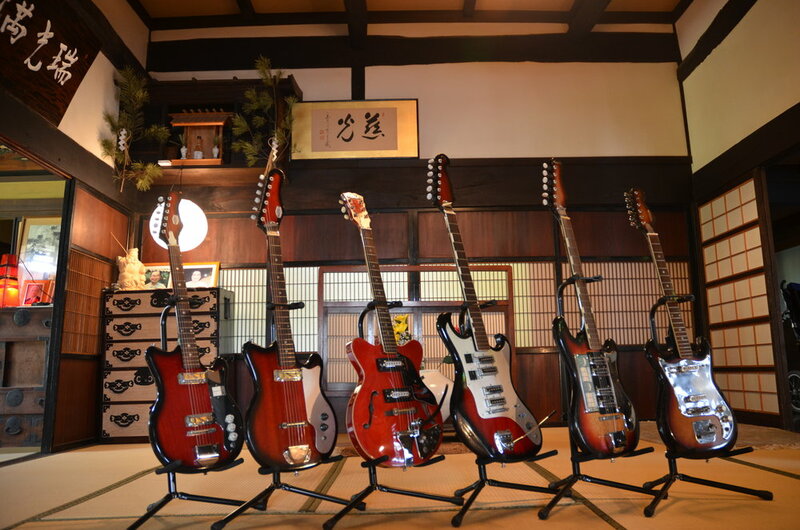 They really couldn’t believe that a Westerner had come all the way to Japan to talk about guitars from 50 years ago. These “guitar people” really underestimated their value to guitar history, and music history. I suppose in the end it all comes down to, what was your first guitar? For me, it was my Marvel. And would you believe I actually returned that guitar to Japan, to the people who made it in 1962. Folks, it all circles around now doesn’t it?